Eugène Delacroix, Paris (1798 - 1863); Paul Huet, Paris (1804 - 1869); by descent to Maurice Perret-Carnot, Neuilly-sur-Seine; (Pierre Miquel, Paris, 1966); Frank Anderson Trapp [1922-2005], Amherst, MA, 1966; gift to NGA, 1999. 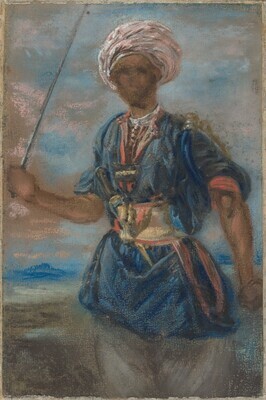 Delacroix and the Romantic Image: Oriental Themes, Wild Beasts, and the Hunt, Mead Art Museum, Amherst, MA, 1988, no cat. no.